When you share a link on social media channels, are you able to properly attribute your website traffic to a specific link? Do you know how to effectively track links? Google Analytics can help you understand and analyze referral traffic coming from different social media channels. However, unless the URLs you share are tagged, your standard GA reports won’t tell you which specific social media links drove the traffic to your website. 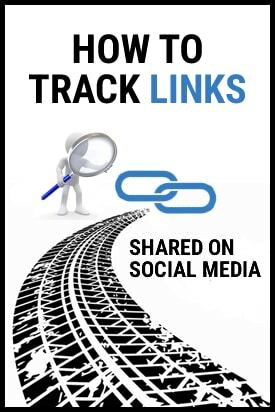 Link tracking allows you to do exactly that – track links you share on social media. You’ll know if social media traffic came from a link you shared in a tweet, in a Facebook post, or in a LinkedIn group. Knowing how much traffic you’re getting from a specific link will tell you how popular it is and which channel is most effective for the type of links you share. In this article, we’re going to show you four different link tracking tools you can use to identify specific social media traffic so you can get a better understanding of the success of your campaigns. Google’s Campaign URL Builder is a free link tracking tool that lets you create URLs with UTM parameters so you can easily track the performance of those links in Google Analytics. UTMs are tags that you add to the end of a URL and they are used to track custom campaigns in GA.
Website URL – The website address of the link you want to track. Campaign Source – Here you’ll specify where you are sharing your link, e.g. Facebook, Twitter, LinkedIn, etc. Once set, the Source parameter will tell Google Analytics where the traffic is coming from. In the example above, we’re adding Facebook as a source for our example campaign. Campaign name – Give a unique name to each social media link you want to track so you can easily identify it in Google Analytics. Campaign term – If you are sharing a link in a social media ad, here you’ll enter the keyword you use to target the paid ad. Campaign content – This parameter is mostly used for ads. For example, if you have multiple ads leading to the same page you can add a content tag to differentiate your ads. This way you can see in GA which ads are driving traffic to your landing page. If you are running ads and you link your Google AdWords and Google Analytics accounts, Google will automatically tag your advertising campaigns. Bonus tip: If you want to tag the links you share on social media sites quickly, there’s no quicker way than using a Google Analytics URL Builder Chrome Extension. Once you install the extension, you’ll see its icon next to your address bar on the top right corner of your browser. The extension allows you to tag a link with a simple click while you’re on a website. You’ll get the same tagging options as in Google’s Campaign URL Builder without having to leave the site you’re on. Bit.ly is one of the most popular link shortening tools out there but it’s more than just that. Its major advantage is the option to track links and manage them. Bitly shows you how many times each individual link has been clicked and where it has been shared, so you know exactly which links are driving traffic to your content. If you run a campaign that includes Bitly links on Twitter, Facebook, and LinkedIn you’ll be able to easily track the number of clicks in each. You can see an example in the image below. What’s great about it is that you get the basic link analytics with a free account. If you’re looking for more advanced options for tracking links, Bitly has an enterprise plan that includes some really useful features such as campaign metrics and analysis, link optimization, audience intelligence, and more. 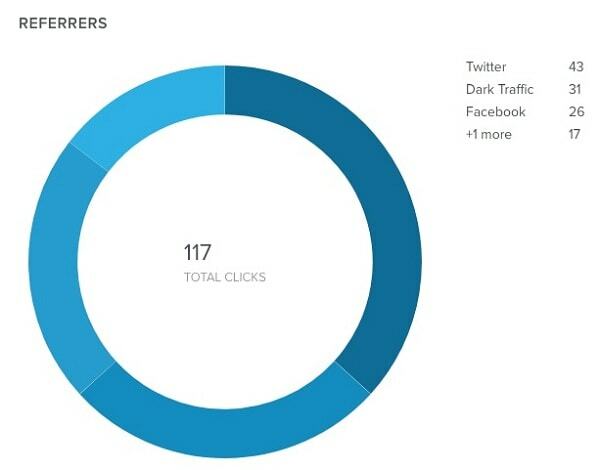 Campaign analytics will let you compare the performance of your links across campaigns and channels. If you’re looking to get a deeper insight, you can use the Intel feature which will help you understand when your audience is most active e.g. time of day and day of the week when people are clicking on your links. 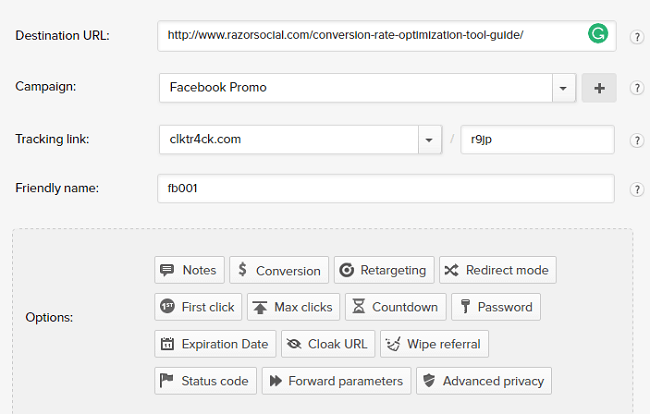 With more than 100 features, ClickMeter is one of the most comprehensive that you can use to track links. It collects a large amount of data to help you with marketing attribution and link analytics. ClickMeter is free for up to 1,000 links shared per month with paid plans starting at $29 /month. ClickMeter generates in-depth reports providing insights into which campaigns and traffic sources are performing well in terms of clicks and conversions, and which are not bringing you results. Once you sign up, you’ll be able to create campaigns as well as tracking links. To start tracking your social media links, just click on the Create New button in the upper left corner of your dashboard and choose “tracking link.” You’ll get a simple form to fill out to create a tracking link you can easily share on social channels and track where and how people share it, how much they click on it, etc. 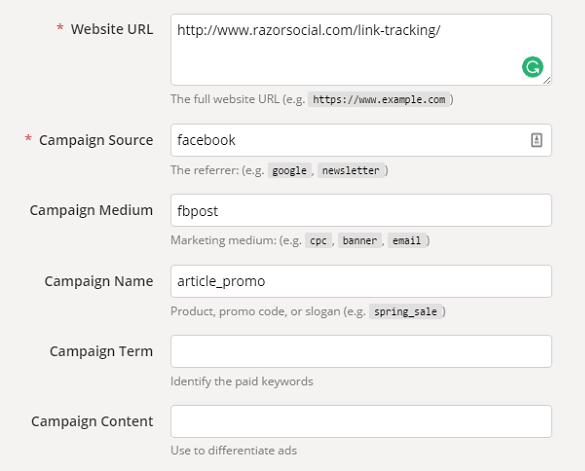 Similarly to Campaign URL Builder, first you’ll enter the URL you want to track. Next, you’ll choose a campaign that this link belongs to (or create a new one by clicking on the plus button) and customize the link if you want to. The Friendly name field is a link name that you can add for your reference only so you can identify the link in your ClickMeter reports more easily. There are also a number of additional options to help you further customize your tracking link, like adding notes, tags, expiration date, etc. When you’re happy with the changes, just hit Create Link! After your link gets at least one click, ClickMeter will automatically start gathering data like traffic source, general location, and others. You can also add UTM parameters to the link you created so you can track it in Google Analytics. Sharing other people’s content on social media is pretty common, but how do you get value from those links when you’re sending your followers to third party websites? There’s a tool to help you with that – it’s called Sniply and it offers a lot more than your regular URL shortener. Besides shortening links for easy social sharing, Sniply adds a call to action to every link you share, helping drive traffic back to your own website, blog, or any other landing page you specify. Step 1 – Set up your brand by uploading a photo and entering your company name. Step 2 – Add a call-to-action including a short message and a button linking to your landing page. Step 3 – Choose a link to an article you want to share. This can be a URL of any web page you want to share and feature your CTA within that page. Step 4 – Share your snip! 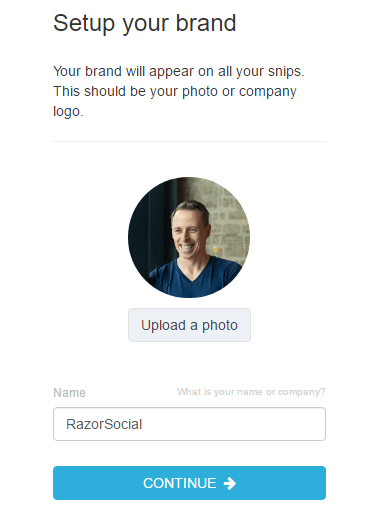 You’ll get your snip and an option to share it out on social media directly from the tool! After your snip is live, you can track links performance in terms of clicks, engagements, and conversion rates from your Sniply dashboard. When you share links on social media, naturally you want to be able to track links to see which ones are performing the best. You can use one of the 4 tools we talked about to easily track and analyze your social media links so you can tweak your campaigns accordingly and drive more traffic to your website. How do you track links you share on social media? Have you used any of these four tools? Let us know in the comments!